She doesn’t really have cancer. Nor does she die. The emphysema patient in this photograph is now walking without oxygen, enjoying her renewed appetite, and “‘very, very happy.” Thus, the title of this post, like the photograph itself, tells a lie. Or does it? Let’s first identify what’s misleading about the photograph. 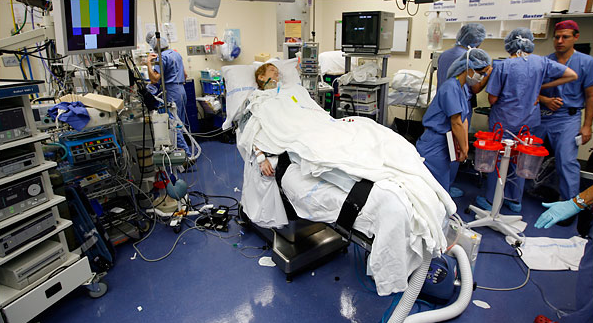 We see an OR/intensive care patient looking as if she has been left to die. Head and hand reveal her pale skin that is otherwise shrouded in layers of white, as if already prepared for burial or fading into some gauzy realm of the spirit. The turn of the head and lifeless droop of the hand suggest that she has no energy left. All but one of the staff in the room has turned their backs to her, and he is intently focused on something else. It’s as if she isn’t there or is already inanimate. Hooked to machines at each end of her body, their currents seem to flow through her uninterrupted on to the monitor hanging overhead that shows only a test pattern. The metal table could be used in a morgue. She is placed in the vanishing point of the picture. Louis P. Masur deftly summarized a standard criticism of photography in a recent review: “‘The devious lie of a snapshot’ is a marvelous phrase. It is not the photographer who is devious, but the snapshot itself, which isolates and freezes action, disconnecting it from context and sequence.” (Masur is quoting photographer Thomas Hoepker.) This cautionary note would seem to apply directly to the photograph above: what looks like a death scene is in fact a woman beginning her recovery from disease to life. I think there is more to be said, however. The image accompanies two stories, one about an operation used to treat emphysema sufferers by removing sections of their damaged lungs, and another, much longer front page story about how a past smoking boom among woman is now a major killer. As deaths from chronic obstructive pulmonary disease are rising like smoke in an updraft, and medical costs scaling upward along with them, considerable attention is being focused on the various techniques being mobilized to manage the disease. One strong theme of the story is that we must avoid blaming the victims. OK, but why was nothing said about blaming the tobacco companies, who are not mentioned in the article? We are to not blame individual patients, but we also are supposed to focus entirely on individuals. The disease is an “epidemic” but apparently not a public health problem having a common cause. So there is something right about the photograph, in that it reproduces the newspaper’s framework for the story, which in turn is not merely a compositional strategy but one that reflects key features of how American health care is organized. When disease appears, the medical patient is the center of our attention, and she will live or die according to how well the society mobilizes high-tech, capital-intensive medical treatments for each individual. The photograph can lie, but it also reveals. This photo depicts three forms of inattention built in to our health care system: First, the photo depicts how medical staffers in the room are completely indifferent to her because she already has received their expert care; they know that there is little to worry about as they debrief, clean up, and make the transition to the next case. Second, because they are on the job, we don’t have to pay attention unless we’re likely to end up on the OR table. Epidemic? Not to worry. Third, by focusing on the effects and not the causes of the epidemic, the image models an artificial blindness regarding the causes of a serious public health problem: we are to not see the tobacco companies that work relentlessly to addict people to their carcinogenic drug. I think the truth of the photo goes beyond its inadvertent performance of a form of blindness. Some of the bad news is seeping out of the frame. Look again at the scene, particularly at the swirl of wires and the rat’s nest of electronic gear. We are looking at a real place of work, but also a society that is held together by a snarl of gerry-rigged connections always on the verge of being jostled, bumped, or broken. It works because there is a lot of expensive equipment combined with serious, no-frills professionalism, but it also is a messy assemblage without any means for doing anything other than responding to disasters seemly not of its own making. The room is functional but closed off from thinking about public health. The work done there is miraculous but very costly. The operations interrupt suffering but do nothing to prevent it. When her care is structured by the American health care system, the patient is in good hands, but she may be in a cancer ward after all. The question is not whether there is hope for her, but whether there is hope that the system can be changed. In the photograph, the patient is completely without the ability to do anything, and so is the public audience. She will live, but we may be dying. Next Post →Sight Gag: Which End Up? Im using this image and gathered a few points from the review in an assignment. For reference and citation purposes, i was just wondering who wrote the review and who/where the photograph was taken? F: follow the links in the post to find the answers to your questions.